Years ago, I read a wonderful article in American Heritage about the great jazz singer Ethel Waters. The author speculated as to why Waters sometimes wasn’t given her due alongside legendary greats such as Billie Holiday and Bessie Smith. She concluded that living to old age does little to fascinate fans. Holiday was tragic and doomed; Waters was a fat old lady who hugged Nixon. "His life is written in the history of his country." William Clark is in much the same boat. Though Clark lived out a full, eventful, and historic life for decades after the Expedition, and survived Meriwether Lewis by thirty years, his fate is often lost in the controversy that rages on over Lewis’s death. A good place to pay tribute to the life and legacy of William Clark is by taking a pilgrimage to his gravesite at Bellefontaine Cemetery, a very large, beautiful Victorian cemetery that is the last resting place of many prominent St. Louisians. General arrives on horseback with dogs — guns. His grandson on a calico pony hallowing and laughing. Gov. Clark fine, healthy, robust man — tall — about fifty, perhaps more — his hair, originally light, now grey — falling to his shoulders — frank, intelligent. 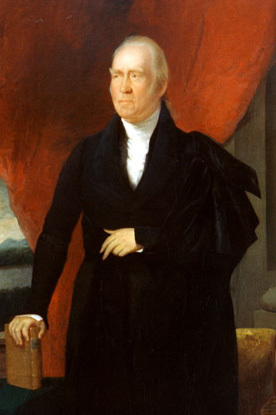 William Clark, by Chester Harding (1820). Courtesy St. Louis Mercantile Library. This gentleman resides far up the Missouri, between the State of that name & the Rocky Mountains. He was attired in a brown hunting shirt, which opened a little upon the breast. It was furnished with a small cape which was copiously fringed. A quantity of fringe also lined the back of the sleeve from the shoulder to the wrist. The skirts were also fringed. The whole was confined to the body by a crimson sash which was tied at one end and the ends hung down to the thigh. The whole dress was extremely picturesque and the whole appearance of the old veteran highly interesting. He was asked if there was a post office in his neighbourhood, & answered with perfect naivete, that there was one about a hundred miles off to which he sent twice a month. He described several peculiar plants & flowers, & and proved as interesting in conversation as he was in appearance. Not everyone was such a fan of Clark’s in his later years. A travel writer who lambasted Clark as “the shadow of a man, scarcely sane,” echoed others who considered Clark to be a man of the past, whose concern and friendship for the Indians was outweighed by the injustices that were actually befalling the Native Americans as a result of the treaties so painstakingly negotiated by Clark and others. Over the course of his career, Clark personally negotiated 37 Indian treaties that resulted in the extinguishment of Indian title to over 419 million acres of Western land. The journalist’s cruel comment heralded a sudden downturn in Clark’s health. Late in 1834, Clark seems to have suffered a small stroke that left him with palsy and ended his lifelong habit of keeping a journal and writing letters. He was never really well again. Physically, he was weak and unsteady on his feet. Emotionally, he was as big-hearted as ever, but he could not longer act as his family’s rock. Financial problems preyed on his mind as never before, and the many troubles of his sons (especially William Preston, who was a raging alcoholic) left him upset and drained. Though he kept his job as superintendent of Indian affairs, his assistant took over most of the complex work. 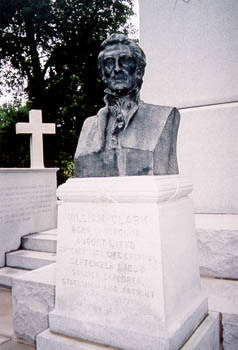 William Clark's monument was dedicated in 1904 for the centennial of the Lewis & Clark Expedition, and rededicated in 2004. By early 1838, Clark was suffering dizzy spells and had fallen several times. He moved in with his son Meriwether Lewis Clark and his wife Abby, but his health declined rapidly in the course of the summer. He died on September 1, 1838, just one month past his 68th birthday. Clark was buried in the family tomb at the farm of his nephew, a wealthy St. Louis businessman named John O’Fallon. His funeral revealed his status and popularity in the community; it was the largest ever held in St. Louis, with thousands lining the four miles between downtown and the O’Fallon farm (present-day O’Fallon Park). Ironically, although the people prized Clark as a beloved representative of the past, they’d long since rejected most of what he tried to stand for, especially decent treatment of the Indians. Even as Clark lay dying, the Cherokee removal disaster known as the “Trail of Tears” was underway. In the 1850s, after Bellefontaine Cemetery opened, Clark’s sons bought a large family plot on a bluff overlooking the Missouri. The graves of William Clark, his wife Harriet, and several of their children were moved to the new cemetery. 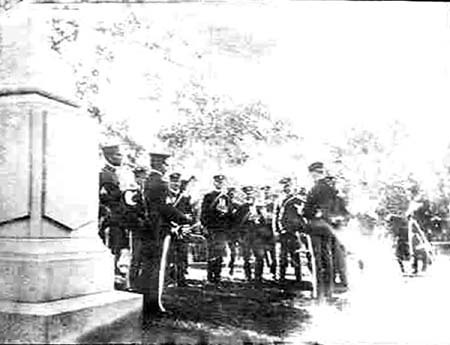 The impressive obelisk and bust depicting a handsome and dignified Clark in the prime of life were unveiled in 1904 during the centennial of the Expedition with funds donated by Clark’s youngest son, Jefferson. It was restored and rededicated in 2004. On our visit, we paid our respects by placing a Texas flag on the grave. I was struck by the fact that servants were also buried in the plot. Undoubtedly these were family slaves, and it was both touching and sad to realize how intertwined were the lives of masters and slaves in those years. It was also moving to see that some of the graves were recent, testifying to the family unity that still binds together the Clark descendants. Overall, this great American could not ask for a better resting place: a serene and peaceful spot surrounded by his family. Looking to connect with people who have done family tree (my Grandfather did by mail and by hand) know that they are related to William Clark. According to Bellefontaine records, my ancestor, Frances ‘Fanny’ Clark Fitzhugh, was also removed from the family farm burial ground at that time and buried adjacent to William Clark. When I was in St. Louis a few years ago, I looked for the gravestone but could not locate it.